Getting there: The Mayfield Nature Preserve sits next to the Laguna Gloria Museum in Tarrytown. To get there, take the 35th street exit off of MoPac and head west. After passing Balcones Drive prepare to veer to the left at a Y in the road. At this point 35th Street turns into Old Bull Creek Road. Look closely for an entrance to the nature preserve on the left soon after the Y. The trails at Mayfield are well maintained and several bridges provide easy stream traversal. 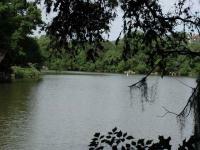 The Hike: Mayfield Park is a small nature preserve overlooked by Austinites. At 22 acres, what the park lacks in size it makes up for in convenience and solitude. One of the things that makes Mayfield interesting is a feature that makes GPS readings harder to come by. The heavy foliage cover over much of the park provided uneven GPS reception for much of the hike, so the mapped out trail that appears on our topo map is a bit less accurate than we would like. 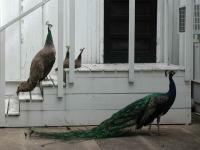 Mayfield features peacocks that live around the stone fenced house and garden that sits near the preserve entrance. The peacocks, garden and koi pools all lend a sense of tranquility just a stone's throw from 35th street. 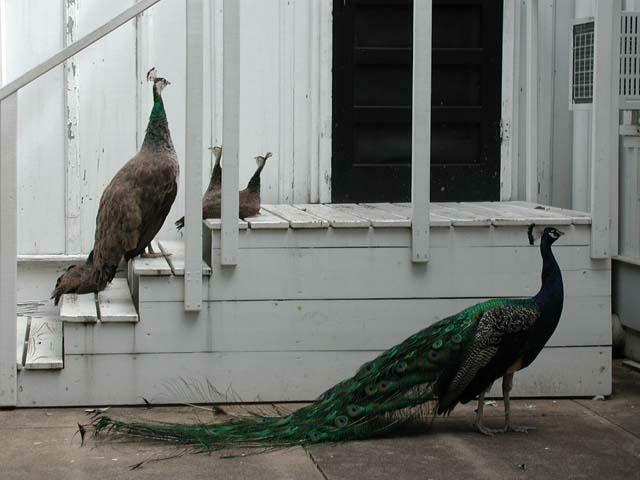 A female and male peacock watch over three chicks, and wait for food at the door. Despite Mayfield's small size it packs a nice set of trails. One simple loop through the park does not do it justice, so we mapped out two loops that will travel over almost all of the trails offered. One loop's trail is highlighted by an excursion on an unofficial trail along a rock ridge on the eastern boundary of the park. We call this one the Mayfield Ridge hike. The second's highlight is the inlet that brings Lake Austin to Mayfield's shores. This one we call the Mayfield Lake hike. Mayfield is a nature preserve, so when visiting it's especially important to leave the wildlife alone, including the peacocks around the garden. When roaming the preserve refrain from boisterous activities and let the serenity of area permeate you. We primarily walked this trail as an excuse to check out the peacocks. 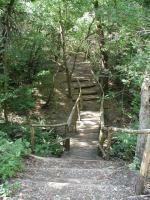 However, there is more to this trail than just the main house. 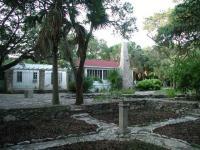 The trailhead begins at the large house, then branches out to the right and the left of the house. It's a fairly easy trail with some interesting vistas. If you take the left fork, you also get a good view of the house on the hill, which is interesting. i love coming here, but somehow i always manage to come during the hottest part of the day. it doesn't stop the peacocks from squawking and strutting, and it doesn't stop me from doing a full round of all the trails. sometimes i start out thinking "oh i'll just swing down by the lake" and next thing i know i'm climbing up the bluff. there are easy ways to go if you're with someone who can't scamper much, but there are also some trails that climb up a bit or have slightly slippery creek crossings, so you can have a mini adventure right here in central austin. unfortunately i do not think this best-kept secret is very secret anymore. i don't begrudge other folks enjoying the observation deck, but i do frown at the increasing litter and empty beer cans. next time i'll bring a trash bag. Lots of trails for such a small area. Make sure to check out the ridge area across the creek. Over a dozen peacocks near the parking lot. Good short hike to do when you visit Mount Bonnell. There were a lot of people there the day we went, maybe because it was the first nice weekend of the year. The trails around the rocks were fun and a couple of creek crossings made it interesting. Can't wait to see the garden area in the spring or summer. Trails were easy to follow and pretty. One trail leads up a small bluff at the edge of the property - a nice view of a creek valley and I stopped and had lunch on top of the rock. Saw very few other people on the trails, but I could hear the peacocks (and the kids calling to the peacocks to get a response) throughout the park. Traffic and construction on nearby houses also intruded. The trail was very easy, well marked, and delightfully circuitous. The trails crisscross all over the place, so this may not be the best destination if your goal is to cover a lot of distance and new ground. However, it was beautiful and relaxing. Went back to Mayfield to try and map out all of the trail segments and I think I still missed some of them! Be aware that the map of the trails at the park entrance is full of errors, but the park's not that big so just keep going and you'll get your bearings soon enough. Didn't see anyone else on the trails, but several milled around the garden area. I have a feeling that most people (including myself, previously) just pass right by the Mayfield Preserve on their way to Mount Bonnell and never really notice it. But it's an absolutely lovely area. You're greeted first thing in the parking lot by a number of peacocks. One of the males was actually in full display of his tail fan, even. Then once you get on the trails it's just a terrific place for meandering. There are lots and lots of trails, so just start walking and don't worry too much about what direction you're going in. The whole park is 22 acres, so you can't get very lost no matter what you do. I was very surprised by where some of the trails went, over ridges and other such that required some scrambling on all fours but were apparently "official" trails with occasional steps and such added in. Great place to just wander around at your leisure. I accidentally ran into the back of Laguna Gloria Art Museum also, while I was out.